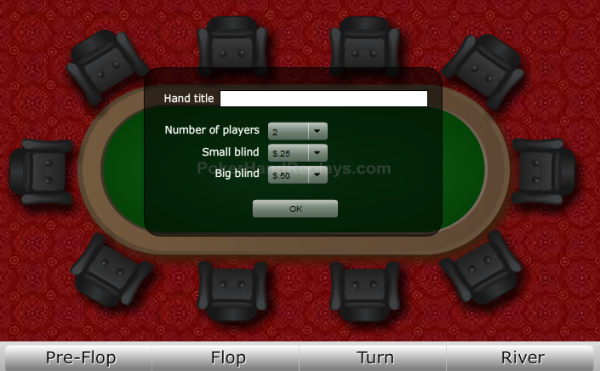 Poker Hand Replays lets you post hands and keep them in a personal account on their website. The benefit is that you can then take hands you’ve posted, replay them in a custom built flash replayer, and then embed it on a website. The site supports tournaments and cash games for Hold’em and Omaha tables and allows importing of hands from many different online poker rooms. Most of us have trolled around the internet and seen various forums where people post hand histories in mundane text. Too often, we just skip over them and never give them a second look. However, when we see a straightforward hand replayer, we’re much more apt to watch the hand and offer our comments. Poker Hand Replays has the art of importing a hand into a Flash replayer down to a science. The best part is that it’s compatible with Hold’em and Omaha hands. Once you’ve created the hand, you’ll see controls to play, replay, or skip to the flop, turn, or river. You can also alter the speed of the hand, click to enlarge for a full screen view, and get the embed codes for Flash, HTML, and BB. The site lets you browse through all poker hands and there are filters for starting hands, position, and won/lost. In addition, there is a Poker Hand of the Day with a quiz feature. All of this makes it fun to go through and see how people played their hands. Who knows? Maybe you’ll even learn something. There are forums at Poker Hand Replays, but there are only a few main threads, so there isn’t a ton going on. The site also has articles aimed at improving micro-stakes players’ games with some great beginner tips. Overall, Poker Hand Replays boasts a very nice tool that’s available to everyone for free. If you operate a blog and like to talk about hands, then this tool should be one to use immediately. It makes looking back at hand histories much more enjoyable and easier on the eyes. If you haven’t seen it already, it’s definitely worth checking out. Full Tilt Poker Game #28017769923: Super Sat to FTOPS Event #7 (216359734), Table 1 - 200/400 Ante 30 - Limit Stud H/L - 13:24:51 ET - 2011/02/08 Seat 1: davecl61 (3,476) Seat 2: RNallin (3,139) Seat 3: Berglar (2,849) Seat 4: dolphin75 (1,200) Seat 5: KingAlex25 (1,798) Seat 6: centrumi (1,870) Seat 8: llama73 (4,629) davecl61 antes 30 RNallin antes 30 Berglar antes 30 dolphin75 antes 30 KingAlex25 antes 30 centrumi antes 30 llama73 antes 30 *** 3RD STREET *** Dealt to Berglar [8c] Dealt to dolphin75 [2d] Dealt to KingAlex25 [4c 4s] [5s] Dealt to centrumi [9d] Dealt to llama73 [6d] Dealt to davecl61 [Ks] Dealt to RNallin [7h] dolphin75 is low with [2d] dolphin75 brings in for 50 KingAlex25 calls 50 centrumi folds llama73 folds davecl61 folds RNallin has 15 seconds left to act RNallin folds Berglar calls 50 *** 4TH STREET *** Dealt to Berglar [8c] [Jd] Dealt to dolphin75 [2d] [2c] Dealt to KingAlex25 [4c 4s 5s] [Tc] dolphin75 bets 200 KingAlex25 calls 200 Berglar folds *** 5TH STREET *** Dealt to dolphin75 [2d 2c] [9s] Dealt to KingAlex25 [4c 4s 5s Tc] [As] dolphin75 bets 400 KingAlex25 calls 400 *** 6TH STREET *** Dealt to dolphin75 [2d 2c 9s] [8h] Dealt to KingAlex25 [4c 4s 5s Tc As] [4h] dolphin75 bets 400 KingAlex25 raises to 800 dolphin75 calls 120, and is all in KingAlex25 shows [4c 4s 5s Tc As 4h] dolphin75 shows [6s 2s 2d 2c 9s 8h] Uncalled bet of 280 returned to KingAlex25 *** 7TH STREET *** Dealt to dolphin75 [6s 2s 2d 2c 9s 8h] [2h] Dealt to KingAlex25 [4c 4s 5s Tc As 4h] [5h] KingAlex25 shows [4c 4s 5s Tc As 4h 5h] a full house, Fours full of Fives, for high dolphin75 shows [6s 2s 2d 2c 9s 8h 2h] four of a kind, Twos, for high dolphin75 wins the pot (2,600) with four of a kind, Twos No low hand qualified *** SUMMARY *** Total pot 2,600 | Rake 0 Seat 1: davecl61 folded on 3rd St. Seat 2: RNallin folded on 3rd St. Seat 3: Berglar folded on 4th St. Seat 4: dolphin75 showed [6s 2s 2d 2c 9s 8h 2h] and won (2,600) with HI: four of a kind, Twos Seat 5: KingAlex25 showed [4c 4s 5s Tc As 4h 5h] and lost with HI: a full house, Fours full of Fives Seat 6: centrumi folded on 3rd St. Seat 8: llama73 folded on 3rd St.